Our findings differ from Stevans and Hicks, who found no effect of right-to-work on manufacturing income, employment or share of manufacturing income, but are suggestive of Holmes and Vedder, Denhart and Robe. However, none of these earlier studies made significant inter-temporal comparisons. This paper has done so, and where data is available examined the periods 1947-1970, 1971-1990 and 1991-2011. These areas appeal to the eye as times of employment growth, stability and decline, respectively (see Graphic 8). The estimates in each of this category tell a similar story. From 1947 through 1970 the presence of right-to-work laws played no significant role in personal income or population growth (total employment was not available throughout much of that period). 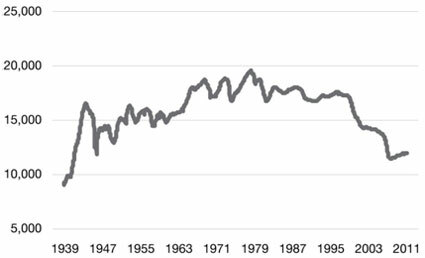 A Wald test confirmed that for population growth, the 1947 through 1970 period was lower than either the later period, 1971 through 1990, or over the entire period, 1947 through 2011. Moreover, the existence of right-to-work laws in adjacent states had no statistically meaningful effect during this period either. The Wald test for personal income was outside the typical level of statistical significance, at just over the 11 percent level. This is consistent with a number of explanations. For example, during rapid employment growth, right-to-work might not matter to employers since they are using union membership as a screening tool for workers. Whatever the cause, it is clear that right-to-work laws did not affect either personal income or population growth during the more than two decades following the 1947 Taft-Hartley Act, a time when manufacturing employment rose briskly in the United States. The period of nearly static employment growth in the most heavily unionized sectors, from 1971 through 1990, experienced a very different effect of right-to-work laws. 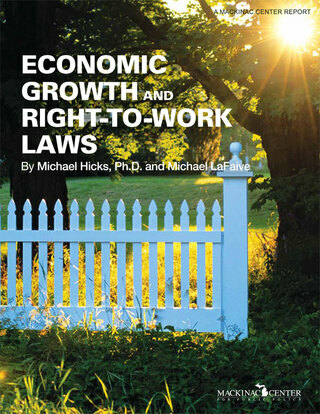 In all three estimates, right-to-work laws had a very strong impact on average annual growth rates of employment, personal income and population — these were 0.90, 0.93 and 1.30 percentage points higher, respectively. In all three cases a Wald coefficient test found statistically different coefficient values for this period when compared to values in the other time periods. By the final period, from 1991 through 2011, the effect of right-to-work laws on these three measures had lessened from the previous period, but remained both statistically significant in each case, and important in terms of the size of the impact — 0.43, 0.67 and 0.56 percentage points higher, respectively for employment, personal income and population. The adjacent right-to-work variable was neither economically nor statistically meaningful in any of our estimates. Overall these results differ from the most contemporaneous work in this area in ways which merit discussion. Holmes tested a two-period model to explain the role of right-to-work in county-level employment in contiguous cross-state borders where a difference in right-to-work was present. Stevans created a heavily parameterized model and examined only 1990, 1995 and 2001-2005 in his estimates. This is a period in which the aggregate impacts we measure were small, but still significant when compared to the earlier period. His cross-sectional model yielded no economic consequences of right-to-work. Vedder, Denhart and Robe tested a model of right-to-work on data from 1977-2008 on per-capita personal income. This research time found results that were very similar to those reported in this study, on a similar measure of aggregate economic activity. Hicks tested the period 1947 through 2005, finding no impact on industrial structure or manufacturing wages. What can be gleaned from this is that temporal choice plays a role in the impact of right-to-work laws. This research suggests that in the early days following the 1947 Taft-Hartley Act, right-to-work laws had little meaningful impact on aggregate economic growth measures in states in which it had passed. During the beginning of the manufacturing employment stagnation (1971-1990) that changed, with right-to-work laws exerting a significant impact on growth of all three measures. In the period 1991-2011, the impacts of right-to-work on growth slowed modestly, but remained large enough that they should command economic policy attention.